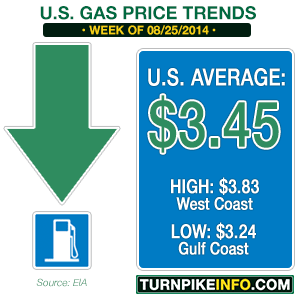 The cost of a gallon of gasoline continued its end-of-summer slip during the past week as prices fell another penny, bringing the average U.S. gas price down to $3.51, according to the latest survey from the Energy Information Administration. Most survey regions enjoyed a decline in prices during the past week, save for the Rocky Mountain states and those living in the Midwest, where prices typically are much more volatile and frequently defy nationwide trends. The August 11 survey represents the first time since March that a survey region, the Gulf Coast, enjoyed prices below $3.30. In fact, retail gasoline averages about $3.27 per gallon for millions of people from the Florida panhandle over to the Texas coastline. The drop in gas prices comes as the summer travel season is winding down and children in many school districts begin returning to school, but consumer demand is only one factor putting downward pressure on prices this year. Bloomberg is reporting this week the abundance of oil from shale sources in North America and elsewhere has been a significant factor in keeping crude prices from soaring. According to Bloomberg, that supply totals about 3-million barrels of oil per day, and that has put a cap on the upper limit of crude oil markets. That upper limit comes despite political instability in a number of regions that, in previous years, had always sent futures markets higher. While crude prices did peak in June, a selloff at the beginning of this month has pushed West Texas Intermediate below the $100 mark. Brent Light Sweet crude, which is the overseas benchmark, has also sold off significantly in the past week, with some investors nearly getting routed during trades last week. That is good news for American drivers, many of whom have been paying $4.00 per gallon or more for gas, typically on the West Coast. Drivers in densely populated areas of the Midwest and the East Coast have also been paying price points above $4.00, sometimes significantly above that threshold. However, the latest E.I.A. survey shows consumer gas prices are below that critical level in all regions, although price pressure in California, particularly Northern California, has kept the overall survey numbers inflated for the West Coast region. 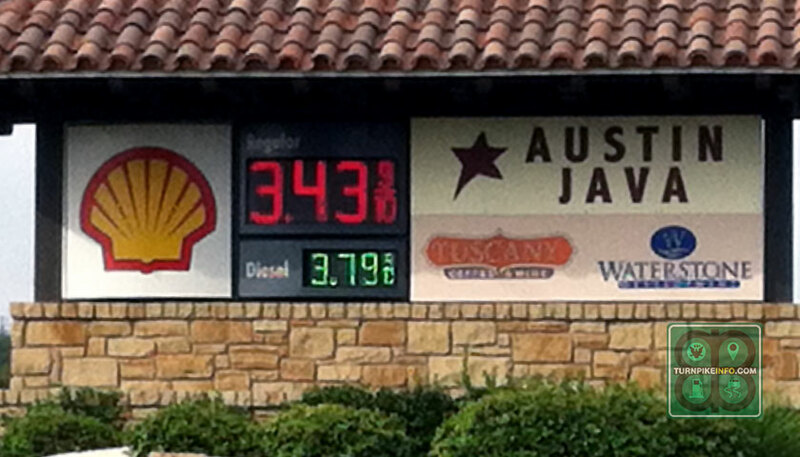 In fact, taking California out of the equation, the average price of gas on the West Coast would be only $3.78. While that number is still higher than the U.S. average, it is far lower than the $3.87 price average that results from adding the Golden State back into the price average formula. Meanwhile, the cost of a gallon of diesel has continued to come down in recent weeks. The E.I.A. survey shows the average trucker is putting down about $3.84 for a gallon of diesel, although prices are well over $4.00 per gallon on the West Coast. The cheapest spot for diesel is, like regular gasoline, the Gulf Coast region, where prices are $3.75 per gallon.